Freedom of the Seas is currently the world's largest cruise ship. The Royal Promenade is the heart of shopping, entertainment and dining, and holds nightly parades. Guests can enjoy a taste of fame in the karaoke club. The Flowrider surfing simulator is the first on any ship. In April 2006, Royal Caribbean International took delivery of the world’s largest cruise ship when the Freedom of the Seas sailed away from Hamburg. This is the first of three Freedom class ships; the others will be delivered in 2007 and 2008. These new ships are some 15% larger in space and passenger capacity than the earlier Voyager-class vessels. The Freedom of the Seas will sail seven-night Western Caribbean itineraries from Miami, calling at Cozumel, Mexico; George Town, Grand Cayman; Montego Bay, Jamaica; and Royal Caribbean’s private destination, Labadee, Hispaniola. The Freedom of the Seas has a length of 339m and a 38.6m breadth. From the waterline to the top of the funnel it is 63m tall. It has a gross tonnage of 158 000t. There are 16.5 hectares of deck space for 5,740 passengers and crew members. It has a passenger-only capacity of 3,634 guests, double-occupancy. There are a total of 1,817 staterooms, 842 with private balconies and 172 have promenade views. The staterooms have Samsung flat-panelled televisions, with an enhanced new bedding programme in every stateroom. Most notable is the 14-person Presidential Suite, with 113m² of interior space and a 75m² outdoor living area with whirlpool. 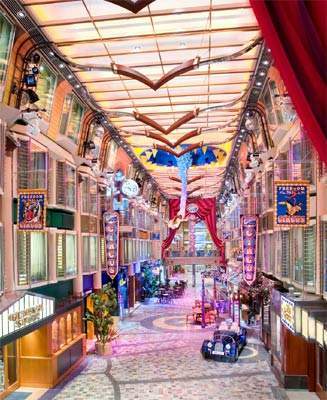 Extending along the centre of the ship is the Royal Promenade, a 445ft-long shopping, dining and entertainment boulevard. It is large enough to host nightly street parades commencing from a revolutionary new descending bridge. The promenade includes a 3,600 volume Book Nook as well as the Italian-style pizzeria, Sorrento’s. There is also the ‘A Clean Shave’ male barbershop. The Art Deco-style Arcadia Theatre can accommodate 1,350 guests. 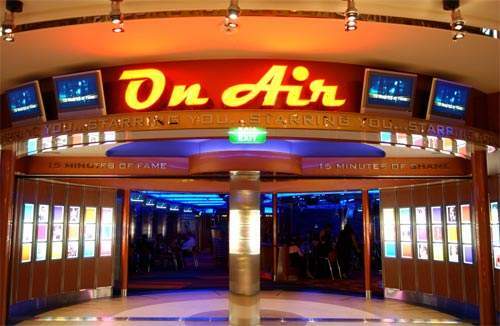 There is an ‘On Air Club’ karaoke venue equipped with state-of-the-art theatrical lighting, video cameras, flat screen TVs. The Sports Deck offers guests a nine hole miniature golf course, a golf simulator, basketball, paddleball or volleyball. There is also an enhanced version of the industry revolutionising rock-climbing wall that first appeared on Voyager of the Seas in 1999. There is the ShipShape Fitness Center and Day Spa. 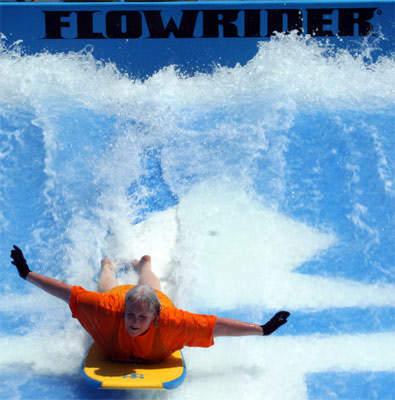 The first FlowRider surfing simulator at sea, which lies on the same deck as the multi-hued interactive sculpture garden as part of the H20 Zone water park. The first cantilevered whirlpools at sea, suspended 112ft above the ocean in the adults-only solarium, which also features a pool flanked by hammocks. Studio B, the onboard skating rink, opens for skating lessons and free skating during the day, and stages ice shows by night. In the Freedom Fitness Center, the largest-ever cruise ship gym, there is the first Everlast boxing ring on a cruise ship. The freedom of the seas is fitted with a central fixed podded unit flanked by two 360º rotatable units each delivering 14MW of thrust. 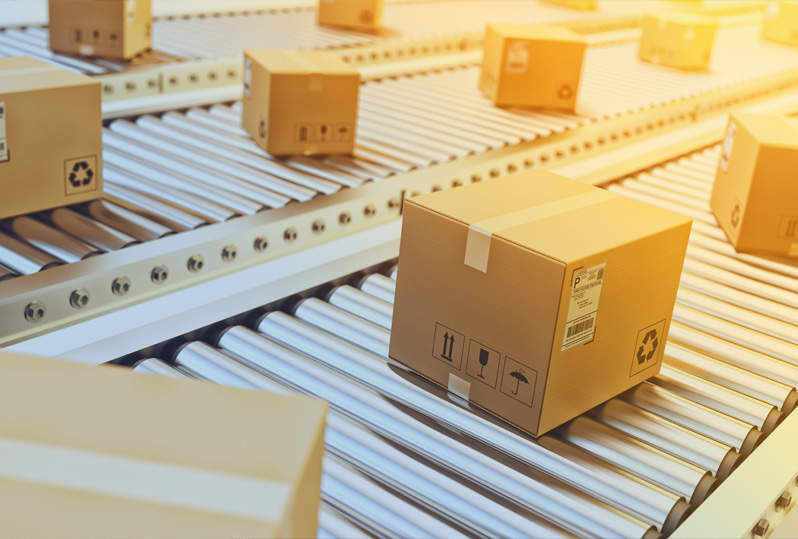 ABB Maritime was also contracted to supply the medium speed switchgear – 43 panels of 11kV uniGear with protection devices, six generators, 19 transformers and low voltage distribution apparatus. The total engine output is 75,600kW and it has a service speed of around 22 knots.